Remember last year when we covered Game by Ronaldo, the plucky start-up competition wanting to take on the 5-a-side world? Well it’s a proper competition, you better believe it baby! If you haven’t a clue what The Game is, then go back and have a little look at our earlier article. Round one of the competition had promised to reward the winner of the competition with a prize of a superb weekend away. If there were any doubts over whether this was a legitimate competition and whether it was the real deal, those doubts have been well and truly blown out of the water. Who were the worldwide winners of round one? A little team called IFC. If that team name sounds vaguely familiar it’s because this site has already spent some time with the guys from IFC last year, who feature in our most popular YouTube video. They’re top guys and they are big-time prize-hunters so it was no surprise to see them embrace The Game early on. After a lot of games played, they topped the Round 1 leaderboard and got an expenses paid trip to Lisbon just a few weekends ago. 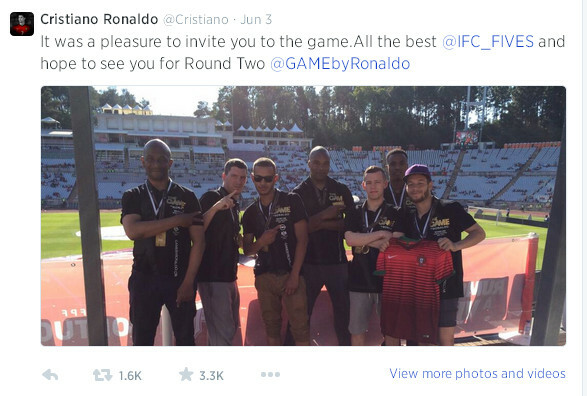 I spoke to them the day before they were due to go and they were wondering if they would meet Ronaldo himself – lots of doubters (including some of the IFC players themselves) thought that they probably wouldn’t. WRONG! Here’s a photo of the man himself with the IFC boys! No expense was spared and the guys got a quality weekend of wining, dining and watching football. This video pretty much sums it up – from the models that met them at the airport to the private box at a Portugal game, they were treated to a rock star experience! So, not only does this well and truly confirm that Ronaldo is all over this competition, but it’s also the real deal in terms of what it promised in terms of prizes. 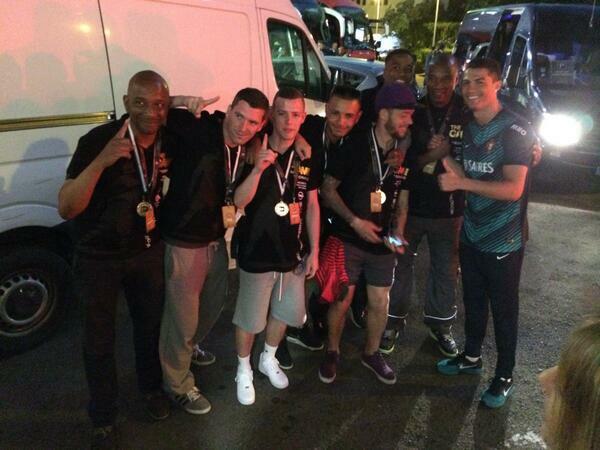 Quality medals, quality trophy, quality weekend away. The message to all the people who sat out round 1 whilst the early-adopters figured out if this is a worthwhile competition: now it’s time you got involved. I asked IFC what it was like in round 1. They told me some pretty hilarious stories of arranging games against opposition only to turn up at defunct leisure facilities and having to climb the fence just to play their scheduled game in the dark! I’m told that this was a one-off, but still, there were some tough moments. At times they wondered if the effort was worth it, but winning the trip to Lisbon has put all of those early doubts firmly to bed. Fair play to IFC, who definitely deserve the prize, not just for their indisputable quality but also for the dedication they put into round 1. Now that people have seen that the competition is the real thing, there are bound to be more teams getting involved in round two. Round 2 kicked off 18th May 2014 and will end on September 21st this year. It’s not too late to get involved – teams can begin registration at any point and start playing games to accumulate those all important points on the leader board. There will be overall prize money of 2500 EUR for each Playoff Location – which will certainly include London, and may include other cities as well, depending on how many teams join. In these locations the top 8 teams will have a playoff after the end of the round and the winner will receive 1500 EUR with second and third place receiving 750 EUR and 250 EUR respectively. Not bad for a free competition! Now that everyone has seen the gleaming prize that is on offer, there are bound to be more teams clamoring to get involved in round 2. Get your team together, get enrolled, and more importantly tell your friends to also get teams together – it’s only going to be coming to your city when there are enough teams to make it worthwhile. At the moment London is a big center for the games, but why not New York, Amsterdam, Deli? Given that in future this competition plans to give you the chance of getting to Dubai and meeting Ronaldo himself, the most marketable footballer in the world, you’d be daft not to think about putting your team in. And even if you don’t claim the top prize, you’ll be playing 5-a-side along the way, so it doesn’t get better than that. Sign up here. A Tweet from Ronaldo Himself. Can IFC be beaten in round 2?